Hey nail geeks! 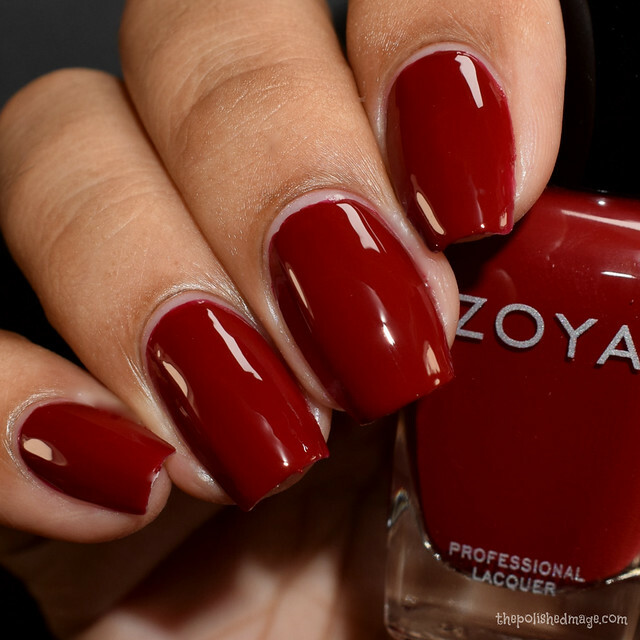 Today I have a massive post to cover the fall 2018 collection from Zoya nail polish! Zoya was one of the first brands that was my gateway into the nail polish community, and I’m very excited to present it to you. The set consists of 12 beautiful creamy neutrals, berries and a little sparkle. Honestly, I think all of these shades will flatter just about every skin tone. I found myself taking my hand away from the light box after application just to admire what a palette cleanser these are. Sometimes, a good cream is so appreciated. Jenna. Swatches show two coats with glossy topcoat. Formula has a medium feel, and applies very opaque. This is a gorgeous dusty rose with cool undertones. Dries down glossy and I think is a perfect fall pink. Rumor. Swatches show two coats with glossy topcoat. This is a rich mauve that has a pearly shimmer effect. It can apply a touch streaky, so be careful with your brush strokes. In my macro I think the streaks look more apparent, though in person it’s hardly noticeable and blends in with the shimmery appearance. I think this leans very neutral on me, but still super flattering. Alyssa. Swatches show two coats with topcoat. This is a very cool toned deep red, and applied very smooth. It dries down very glossy, so any topcoat will do. One thing I really like about Zoya creams, is that they give that nice thick look in one to two coats, and make me feel like I went to a salon for a gel mani. Leighton. Swatches show two coats with topcoat. Leighton is a vampy girl, she’s a very dark eggplant that photographed almost black to me. I think my swatch video will show her purple side better. Formula has a medium feel and applied very rich. Just go slow during application and you won’t have any problems. Gardner. Swatches show two coats with topcoat. This is a another that is showing a little streaky in my photos, but in person it all blends in with the shimmery appearance and hardly noticeable. Formula has an interesting medium/light feel but applies rich. In person she’s leaning a little more purple. I’d describe it as a a tricky blurple with blue undertones. There’s lots of shimmers and pink flecks in here, that give an almost foiled look. Rachael. Here’s another super vampy girl. Swatches show two coats with topcoat. She’s a cool toned burgundy that is a few shades darker than Alyssa. All of these creams apply super glossy, so I think any topcoat will work just fine. The self leveling on all of the creams is crazy awesome too. Minimal brush strokes are required and after topcoat, most mistakes are not noticeable. Devin. Swatches show three coats with topcoat. Formula has a light feel, but no VNL is seen on the third coat. This is very shimmery, with lots of different colored flecks. I’m seeing reds, golds and a some copper in there too. The base is a dusty purple. This dries down satin like, so I’d recommend a glossy topcoat. Ruthie. Swatches show two coats with topcoat. This is a pastel, dusty pink with just a touch of blue undertone. Very flattering on warm tones, in my opinion. Dries down glossy and once again, gives that gel like look in the final look. Maeve. This is a purple I can totally get behind. This is a rich grape, opaque for me in two coats and dries down glossy. This shade is intense, and in your face but in a dark way. I feel like my swatches are color accurate, so purple fans- this one is right up your alley if you like loud, but rich tones. Maryann. Swatches show two coats with topcoat. This is a pink toned rose with gold shimmer. Once again, I think my macro is showing streaky, but in person it’s hardly noticeable. It has a warm glow overall, and dries a bit satin like. Go easy on your brush strokes and you’ll be just fine. Kendra. Ugh I loved this one. Swatches show one coat with glossy topcoat. In my swatch video you’ll see I went a little heavy handed with this one to show that depending on application, you can get away with one or two coats. (I usually prefer more coats, applied thinly but this one just felt like it should be applied a little heavier). Formula is that medium type rich feeling that the others have. Any topcoat will be fine again, since this also dries down glossy. Donnie. Another top pick for me. This is a gorgeous dark fuchsia to me. The website describes it as a sangria with purple undertones. I’d have to agree to that, though I’d call it a dark fuchsia pink with purple undertones. Very interesting color, that I really liked on me. I think this will really pop on anyone. Dries glossy, so any top coat will be fine. I think it’ll look awesome matted too. The Element collection is available at Zoya’s website, and also through retailers like Ulta. Be sure to check out my video swatches that’ll show how creamy they all apply.